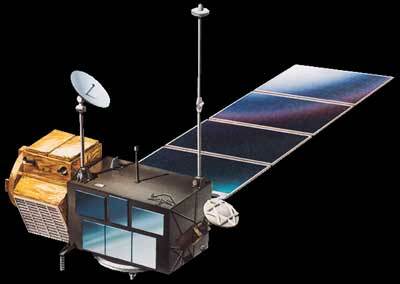 The TOPEX/POSEIDON satellite was launched on 10 August 1992 with the objective of "observing and understanding the ocean circulation". A joint project between NASA, the U.S. space agency, and CNES, the French space agency, it carries two radar altimeters and precise orbit determination systems, including the DORIS system. TOPEX/POSEIDON is laying the foundation for long-term ocean monitoring from space. Every ten days, it supplies the world's ocean topography, or sea surface height, with unprecedented accuracy. TOPEX/POSEIDON is a space laboratory. NRA or NASA Radar Altimeter (206 kg including redundancy, 237 W), operating at 13.6 GHz (Ku band) and 5.3 GHz (C band) simultaneously is provided by NASA. It is the fifth generation of altimeter; its design is based on the previous SEASAT and GEOSAT altimeters with significant improvements including the 5.3 GHz channel for the ionospheric measurement. It is the primary sensor for the TOPEX/POSEIDON mission. The measurements made at the two frequencies are combined to obtain the altimeter height of the satellite above the sea (satellite range), the wind speed modulus, the significant wave height and the ionospheric correction. The TMR (50 kg including partial redundancy, 25 W) measures the sea surface microwave emissivity (brightness temperatures) at three frequencies (18, 21 and 37 GHz) to provide the total vapor content in the troposphere along the altimeter beam. The 21 GHz channel is the primary channel for water vapor measurement. The 18 and 37 GHz channels are respectively used to remove the effects of wind speed and cloud cover (liquid water contribution) on the water vapor measurement. Measurements are combined to obtain the error in the satellite range measurements caused by pulse delay due to water vapor and to obtain the sigma naught correction for liquid water absorption. DORIS or Doppler Orbitography and Radiopositioning Integrated by Satellite (43 kg including redundancy, 21 W) is a French system that uses a two-channel receiver (401.25 MHz and 2036.25 MHz) to observe the Doppler signals from a network of about 50 ground transmitting beacons. It provides all-weather global tracking of the satellite for precise orbit determination. DORIS beacons are equipped with meteorological sensors measuring temperature, humidity, and atmospheric pressure to correct for atmospheric effects on the transmitted signals. The DORIS signals are transmitted at two frequencies to allow the removal of the effects of ionospheric free electrons on the tracking data as well as the altimeter signals. SSALT also called POSEIDON validates the new technology of a low-power (49W), light-weight (23 kg without redundancy) altimeter for future Earth observing missions. It is provided by the French Space Agency (CNES). It shares the same antenna as the NRA; thus only one altimeter operates at any given time. It operates about 10% of the time, or one cycle over ten. SSALT operates at a single frequency of 13.65 GHz (Ku band). Measurements give the same geophysical information as NRA's. However since this sensor uses a single frequency, an external correction for the ionosphere must be supplied (see the DORIS instrument). The GPSDR (28 kg without redundancy, 29 W), operating at 12227.6 MHz and 1575.4 MHz, receives signals from up to 6 GPS satellites. The GPS antenna is mounted on a long boom to reduce multipath effects which can severely corrupt the measurements. These satellite data plus tracking of GPS from ground sites allow nearly geometrical solutions. Precise tracking of the satellite is made possible by using the technique of Kalman filtering and a new GPS differential ranging technique. TOPEX-Poseidon was retired in January 2006. Its mission was continued by the Jason 1 satellite.